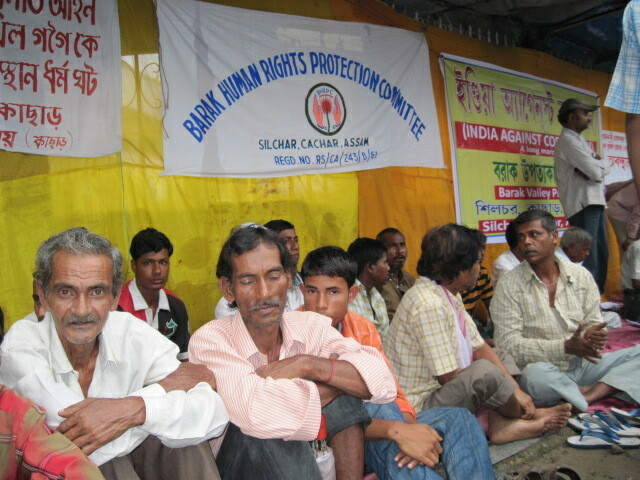 About two hundred social activists and human rights defenders, representing 15 mass organizations working in Barak valley of Assam, gathered in front of the Deputy Commissioner’s Office of Cachar district at Silchar in a demonstration on 1 July 2011 to demand immediate release of Mr. Akhil Gogoi, general secretary of Krishak Mukti Sangram Samiti, Assam (KMSS). Mr. Gogoi was arrested by Assam police on 24 June, 2011 for his alleged role in the rioting of the landless protestors who were demonstrating against eviction drive of the government of Assam on 22 June, 2011 in Guwahati. 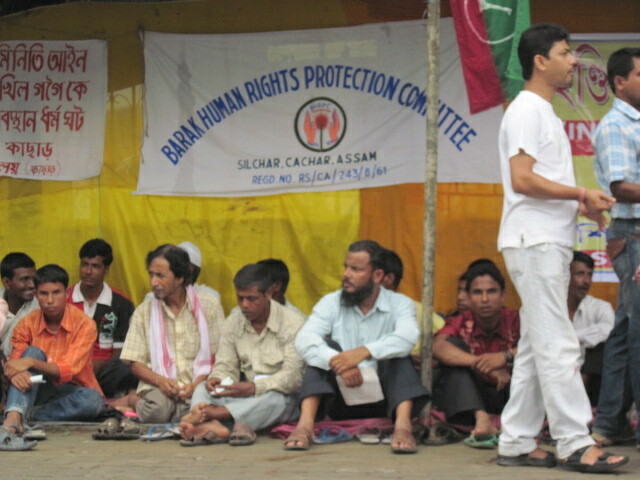 The peaceful rally of the landless people who settled in the forest areas of the periphery of Guwahat turned violent allegedly at the provocation of the law enforcement officials. The police opened fire and killed 3 persons including a passer-by child. Many people sustained serious injuries. 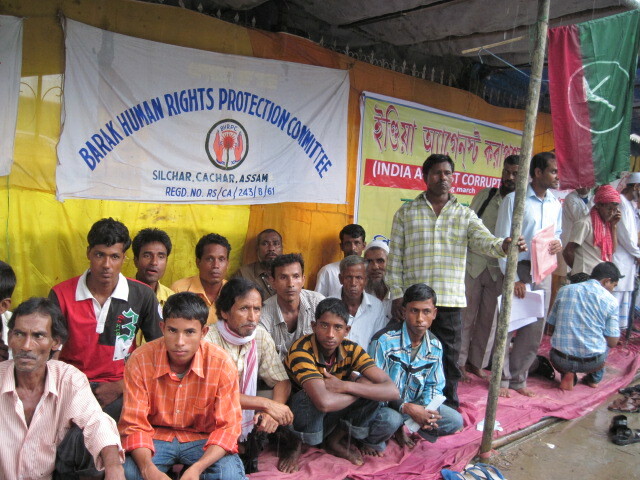 The demonstration at Silchar called by Barak Human Rights Protection Committee (BHRPC) along with other 15 mass organisations, who came together to fight against corruption and injustices in Barak valley including Asom Mozuri Sramik Union, Kishan Bikash Samiti, Krishak Mukti Sangram Samiti, Center for Integrated Rural Development, Chorus, Shwaviman, Srikona Club, Kalpataru Club etc., submitted a representation to the DC addressed to the Prime Minister of India demanding immediate release of Mr. Gogoi, prompt and impartial enquiry into the incident by the Central Bureau of Investigation (CBI), payment of an adequate amount of money as ex-gratia to the family members of the deceased and adequate medical care and compensation to the injured. The memorandum says that it is an act of violation of human rights to keep a person in custody or in detention without any conviction or any reasonable cause. The activists say, circumstances surrounding the incident and subsequent actions of the government indicate that the reasons for arrest of Mr. Gogoi is his work as the general secretary of KMSS. According to them, Mr. Gogoi is a prominent human rights defender, right to information activist and a crusader against corruption in the state. His human rights and RTI work and protest against anti-people and repressive government policies tend to expose the government before national and international communities and cause embarrassment. The government, therefore, wanted to muffle his protesting voice. 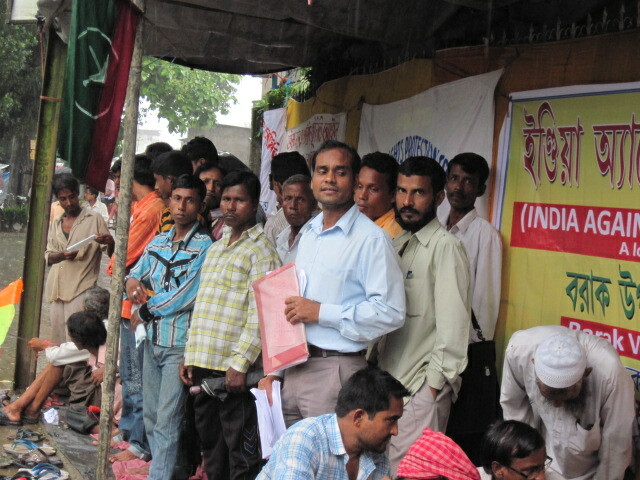 They claim that the government of Assam can not be trusted to conduct an impartial investigation into the matters. Because, according to them, Mr. Gogoi is being victimised by the same government. The incident of 22 June, 2011 must be thoroughly investigated by the CBI promptly and impartially. The memorandum further says that the investigation must encompass the roles of police officers and other law enforcement officials. 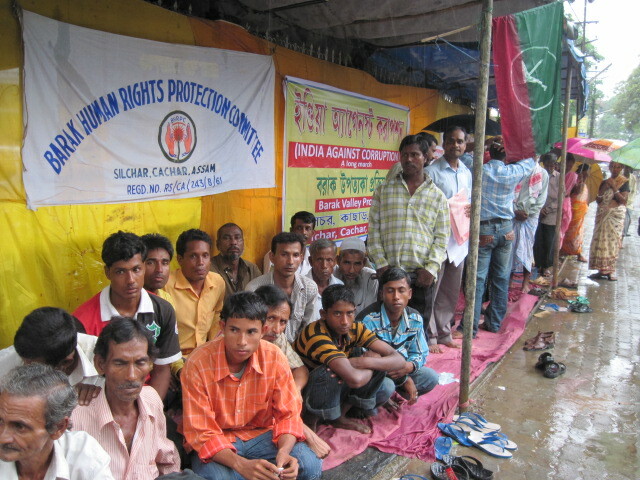 Mr. Akhil Gogoi and any other persons must not be remain and taken in custody until and unless they are found guilty of offences in a trial consistent with the International Human Rights Standards by an independent and impartial judiciary and based on the evidence gathered in an impartial and trust-worthy investigation. 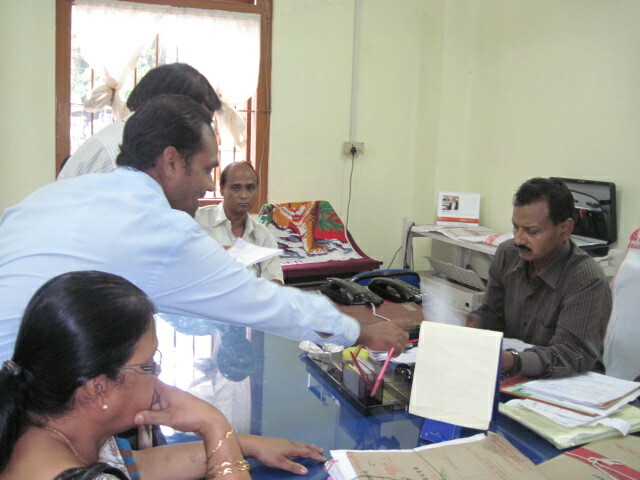 Another separate memorandum has also been filed to the DC regarding anomaly and corruption in the survey and preparation of the list of people living Below Poverty Line, Public Distribution System and National Rural Employment Guarantee Scheme. This entry was posted on July 2, 2011 at 9:33 am and is filed under Events, News, Press Releases. You can follow any responses to this entry through the RSS 2.0 feed. Both comments and pings are currently closed.